Barbra Streisand is in a league of her own. For 56 years, Barbra Streisand has entertained the world throughout her outstanding performances on both the Broadway stage and the silver screen. Ms. Streisand has also won ten Grammys, two Oscars, three Golden Globes, and was a recipient of both the Kennedy Center Honor and the Presidential Medal of Freedom. 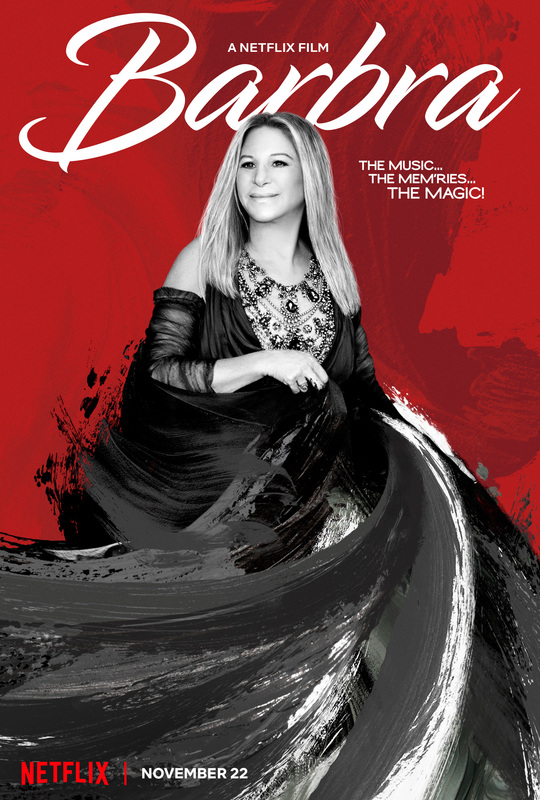 Earlier this year, Ms. Streisand wrapped her latest North America tour: Barbra: The Music, The Mem’ries and the Magic. She visited numerous cities around the United States including Los Angeles, Las Vegas, Miami, Chicago, Washington, D.C., and three performances in her hometown of Brooklyn, New York. With the help of director Jim Gable, producers Ann Kim and Ned Doyle, plus Marty Erlichman, her manager of 50 plus years, Barbra Streisand was able to capture the magic of her epic tour when she visited Miami for an epic performance that caught all of the elements of her storied career. This intimate one-hour, 48-minute concert features some of Ms. Streisand’s best performances in this decade. The Netflix exclusive kicks off with Ms. Streisand touching down in Miami, where she is the final dress rehearsals at the American Airlines Arena. Several of Barbra Streisand’s veteran collaborators such as Mr. Erlichman, Concert Co-Director Richard Jay-Alexander, and Music Supervisor Jay Landers talked about how going on tour forces the entertainer to go out of the box. Following a highlight reel, Ms. Streisand crossed the stage to a massive standing ovation from her audience and states that “this night is about the “Mem’ries” as she dove into “The Way We Were.” I expect that the viewers will get the same goosebumps I did when Barbra sang the first verse of her iconic signature song. Also, Ms. Streisand’s voice proves that she could outsing some of today’s supposed stars. Even, Barbra went on the record and said how much she enjoyed making records. Viewers would be in awe when they see all 35 studio album covers flash across the screen. She also delighted to add that she was proud of the ten albums that went straight to number one on the music charts. All throughout the special she did make noteworthy comments about current events and added that “music transcends politics.” Several parts of her set list such as her interpretations of both Carole King’s “Being at War with Each Other” and the Leslie Bricusse and Anthony Newley-penned “Pure Imagination.” When Barbra performed both songs, numerous clips flashed across the American Airlines Arena’s big screen while she sang. Images from the Vietnam War to 9/11 along with activists Nelson Mandela and Malala Yousafzai popped up during “Being at War with Each Other.” However, the performance that should make an impact on the audience might be “Pure Imagination,” as Ms. Streisand talked about the dangers of climate change. Before the images of polar bears, dolphins, and magnificent rainforests flashed on the screen, Barbra pleaded with the Miami audience that 375 Nobel Prize scientists confirmed that climate change was real. She also added that the Pentagon said that climate change would be detrimental to the United States’ armed forces.